Guest blogger Bob Walter provides some interesting facts on Indiana Henry. Indian Henry was believed to be an Upper Cowlitz Indian. Born about 1825, he moved his family in the 1860’s and established a prosperous farm at Mashel Prairie, just above the site of the earlier Mashel Massacre. He had three wives, until ordered by a Tacoma judge he could have only one. In 1883 Indian Henry guided James Longmire, P.B. Van Trump and two others to Mount Rainier (then called Tahoma). It was on this trip that Longmire discovered the hot springs that bear his name. In 1888 Henry guided famed naturalist John Muir and six others to the mountain. These and many other adventurers stayed at Indian Henry’s home on Mashel Prairie before proceeding further up the line to the mountain. His habit of trading with gold nuggets spawned a legend that he had a fortune in gold hidden in the hills. Henry was a friend to T.C. Van Eaton and most of the other early pioneer settlers. A beautiful alpine slope on the west side of the mountain is named Indian Henry’s Hunting Ground after him. The earliest trail from Commencement Bay to the mountain is known as the Indian Henry Trail. An engraved, granite marker still stands at the corner of South 84th and Thompson Sts., marking the trail. 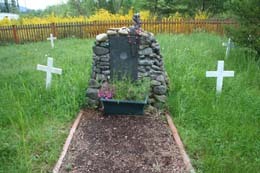 Indian Henry died in 1895 and is believed to be buried at the Shaker Church Indian Cemetery near his settlement. The photo comes from Abbi Wonacott’s site, Early Eatonville, WA, and is one of the only pictures of Indian Henry. Henry is not actually one of the six pictured in your cropped image. Henry is sitting far left of the group of six near the edge of original photograph. John Muir is actually the one you have identified as Henry, William Keith is second to last. Hi, Thank you for this. Can I ask where you got your information, so I can incorporate it? Thanks!